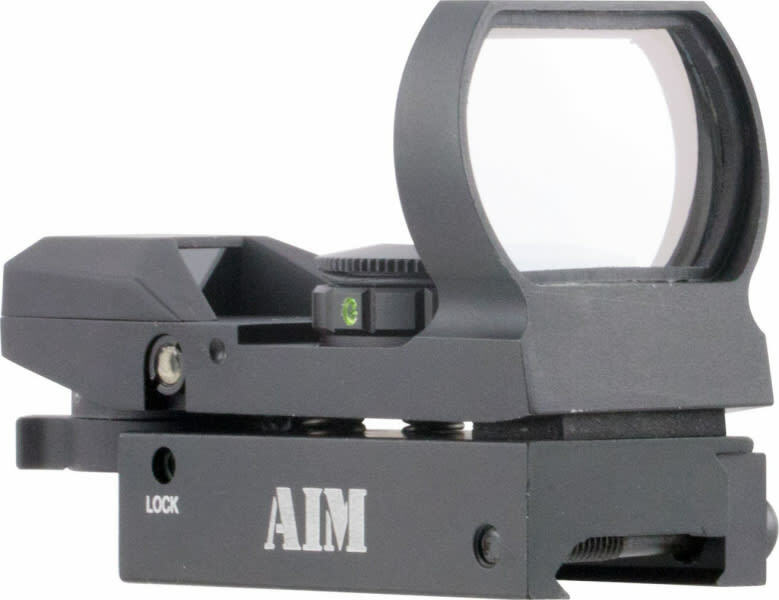 Aim Sports RT4WF1: The Aim Sports Dual Illuminated Reflex Sight Warfare Edition is crafted from aircraft grade aluminum to withstand constant heavy recoil. It has a fog-proof and shock-resistant housing. It is nitrogen-charged with weather resistant seals. The coated lens provides superior light transmission, resolution and scratch resistance. The dual-illuminated (red, green) reticles have adjustable rheostat for brightness control. The four special edition reticle patterns (Arrow Dot, Predator, Smiley Face, Skull) provide variety for any target type. It has an integrated Picatinny/Weaver mounting system. It provides unlimited eye relief for quick target acquisition. It includes a protective lens cover.